I never met (or ate) a rib I didn't like. 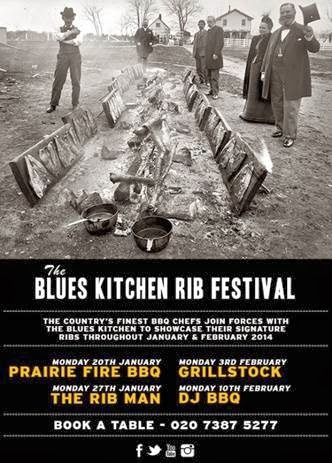 Perhaps after reading my mind, The Blues Kitchen in Camden is holding a Rib Festival on the last two Mondays of January and the first two of February, featuring four different chefs. The most famous is The Rib Man, on the 27th of January; the others are Prairie Fire BBQ (20th), Grillstock (3rd Feb) and DJ BBQ (10th Feb). Please form an orderly queue! - 20 January 2013 - Prairie Fire BBQ - was created in 2013 by a Kansas Citian who moved to London and missed the authentic taste of home, Kansas City Barbecue. He learnt his craft watching his Grandad and created the recipe for the Prairie Fire BBQ original sauce, which is handmade each week. He describes it as Kansas City in a bottle, which has got to be good as the city boasts 100 BBQ restaurants. - 27 January 2013 - The Rib Man – began his training to become a butcher at the young age of 15, and prides himself on the quality of the meat he uses, as well as his secret recipe sauce. Which ranges from a smokey BBQ to his popular ‘Holy F##k’ sauce! Serving ribs at Kerb London, Kings Cross and Brick Lane. Having been reviewed by the likes of Man Vs Food and the evening standard, his ribs are not one to miss. - 3 February 2013 - Grillstock – Grillstock started in Bristol and Gavin McOwan and his friends think there is nothing better than a weekend immersed in smoke, meat and beer. Everything is smoked over hickory wood using their own recipe of seasonings & sauces. - 10 February 2013 - DJ BBQ – Loves to ‘Catertain’ and spends days and night bringing crowds the finest meats and spinning the greatest tunes. Founded by Christian Stevenson, an all-round cool guy, who learnt his recipe for Pulled Pork in Carolina, America, he likes to cook his meat slow and low. The perfect location for a Rib Festival, their Kitchen is already equipped with multiple smokers, which head chef Bernie Rodgers will be lending to the guest chefs. A stack of pork ribs will be priced at £13.90 and beef ribs at £16.50, southern sides from The Blues Kitchen team are available such as crunchy slaw, sweet potato fries, mac n cheese etc. Wash it all down with Big Wave, a light ale, chosen especially as a refreshing drink to compliment the Ribs. The venue is well known as an eating and entertainment venue, so to complete the event live music will include acoustic blues from London Bluesmen and Sam Hare & Oliver every Monday of Rib Festival."